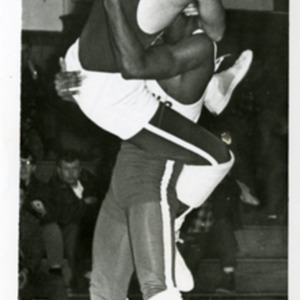 Photograph of a 1964 Wrestling team match with Bob Mosley taking down. Please credit the Paul Smith's College Joan Weill Adirondack Library Archives when citing this material. Please contact the library (library@paulsmiths.edu or (518) 327-6313) to inquire about uses of material beyond accepted Fair Use. “Wrestling 11,” Paul Smith's College Historical Photographs, accessed April 22, 2019, http://archivesphotos.paulsmiths.edu/items/show/4585.